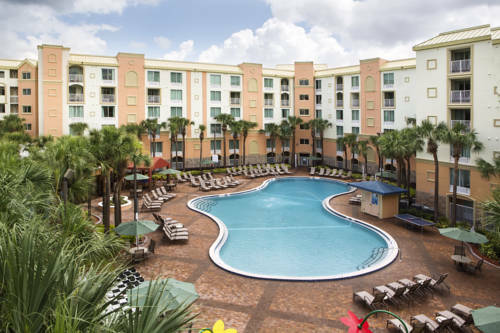 Holiday Inn Resort Orlando-Lake Buena Vista outside Downtown Disney Situated in the heart of Lake Buena Vista and just one mile from the Walt Disney World Theme Parks, Kids Eat FreeHoliday Inn Resort Orlando-Lake Buena Vista is one of the most conveniently located Orlando hotels. Minutes from major attractions, this Orlando resort's superior amenities and service ensure a delightful stay.About one mile from the Walt Disney World Theme Parks, this hotel's property is also near Universal Orlando Resort, SeaWorld Orlando and the Disney Springs area. Shopping and dining options abound at Crossroads, the Orlando Premium Outlets and Lake Buena Vista Factory Stores, all less than one mile from the hotel. Fast and free wired and wireless Internet access helps you stay connected, and on-site meeting rooms are available for special events.This Orlando resort's amenities ensure a memorable vacation. Guests enjoy seasonal poolside activities, including dive-in movies, as well as family-friendly recreation resources like Splash Pad and a Cyber Arcade.Kids Eat FreeThe on-site Applebee's restaurant offers classic American cuisine for breakfast, lunch and dinner, and room service is available. The scheduled shuttles to major theme parks make it easy to see the best attractions in Orlando. Children's program - Unforgettable fun can be found in our arcade with its exciting lights and sounds. Tthere are daily scheduled full-length G/PG-rated movies in our children's theatre located off the hotel lobby. You will also find a daily supervised Activities program. Additional Amtrak Train Station located in 111 East Dakin Avenue Kissimmee, FL 34741 is 21 miles from Holiday Inn Sunspree Resort. Elegant wilderness and a dramatic rolling Florida landscape help define Disneys Osprey Ridge Golf Course where golfers are treated to nature at its finest. The native Florida beauty is sure to test your game while providing cherished golfing memories. Busch Gardens is just short of an hour west of the hotel and is Part of the Seaworld Theme Park chain. They have more actual Amusement rides in addition to their Safari themed park. Just 4 miles from the hotel by car.